The word yoga means union—specifically union with God, and comes from the ancient word “yoke.” As in “take my yoke upon you” (Matt 11:29). Indeed, anciently, yoga was about the practices, principles and disciplines that led one to that state of union with God. 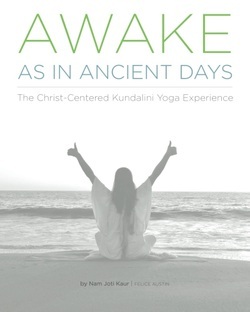 The more that I know about kundalini yoga meditation, and the more that I study the gospels and other teachings of Christ, I see that it is reasonable to assume that when Christ spoke those words, he may have been inviting us to practice his yoga. Kundalini Yoga, as taught by Yogi Bhajan is on of the fastest technologies for elevation and healing and becoming like Christ. Kundalini Yoga is not a religion, and it is not anti-religion. It just works. Fast. I am a Christ-centered healer and Kundalini Yoga & Meditation Teacher. If you'd like to learn more about me or Kundalini Yoga & Meditation, you will find many resources on this site. These e-books are free (PDF) for all newsletter subscribers. To subscribe, click here. To buy it on Amazon for your Kindle, click here. The best way to learn about Kundalini Yoga and Meditation is by experience, and with support. This 40+day challenge and 6 week course will give you the perfect blend of instruction and support so that you will have a solid foundation on which to build your practice. Read testimonials and register in the store here. Level 1 Teacher Training! Click on the tab at the top menu to learn about this upcoming training. This 313 page color book and manual contains everything you need to know for the next couple of hundred thousand years. Click the image to order now. Please leave a review on Amazon if you enjoy it. Tree of Life Kundalini Yoga is cool.